With summer comes a wonderful variety of delicious fruits and vegetables. Zucchini, being one of those, can be found so easily just about anywhere, and is such a great price right now. Take advantage of this tasty and light vegetable by trying out this Stuffed Zucchini Boats Recipe. Filled with fresh tomatoes, basil and mozzarella, this delicious summer side dish recipe also makes a great snack or appetizer and goes well with a variety of meals. It also makes an aesthetically pleasing display on your summer BBQ table! So if you are looking for a healthy, low calorie summer recipe to try that won’t use up a lot of those precious Points, make sure to give these a try! Each “boat” has just 2 Points! Light and fresh, these Stufed Zucchini Boats make a wonderful low calorie snack recipe or appetizer to serve up this summer. 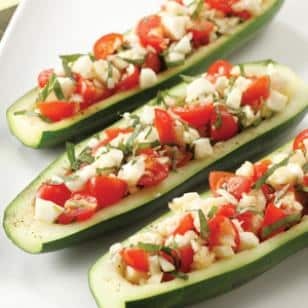 Pretty to look at and even better to eat, each zucchini boat has just 2 Points, making it a fun and healthy side dish recipe for anyone counting those calories. Spray a large, nonstick skillet with non-fat cooking spray and set over medium high heat. Trim both ends off zucchini; cut in half lengthwise. Cut a thin slice off the backs so each half sits flat. Scoop out the pulp, leaving a 1/4-inch shell. Finely chop the pulp; set aside. Sprinkle zucchini halves with 1/4 tsp each salt and pepper. Place zucchini halves in skillet and sauté until tender, but still crisp, about 2-3 minutes on each side. Remove zucchini halves from skillet and set aside. Whisk oil, vinegar, shallot and the remaining salt and pepper in a medium bowl. Add tomatoes, garlic cheese, basil and the reserved zucchini pulp; toss to combine. Divide the filling among the zucchini boats and serve immediately. Is the pulp not cooked at all? I’ve never eaten raw zucchini lol. Love your recipes!….planning a dinner party & these look like a very pretty salad course…I'm already making your crab cakes for an appetizer…Thank you for helping me stay on track with my WW journey! Just discovered this site today and am so excited! My mother and sisters are doing Weight Watchers, thanks to you I have printed them out a ton of recipes! Just had to comment to share how appreciative I am! mmm… Looks like a keeper!